Like many kids of my generation, my parents had made me watch the 1985 Disney live-action movie Return to Oz - which probably turned out to be a lot darker than they had anticipated. Then again, my family celebrated the fine art of scaring children without traumatizing them as best demonstrated by the original stories of the Brothers Grimm and so on. That 1985 movie had borrowed heavily from the same book that was a basis for this limited comic book series. And I guess that's part of the reason this comic endeared itself to me so much. In fact, this was actually the first of the Marvel Oz adaptations that I read and thus triggered my looking for all the prior books as well. These comics tend to scratch a particular itch we feel for the Oz brand of stories and magical fiction. It's an odd balance of the whimsical, the fantastical and the scary. After all, this is the same series that includes wicked witches, flying monkeys, and dreaded Wheelers balanced on separate wheeled limbs. Ah yes, those damned Wheelers will forever hold a special place in my memories after that movie. 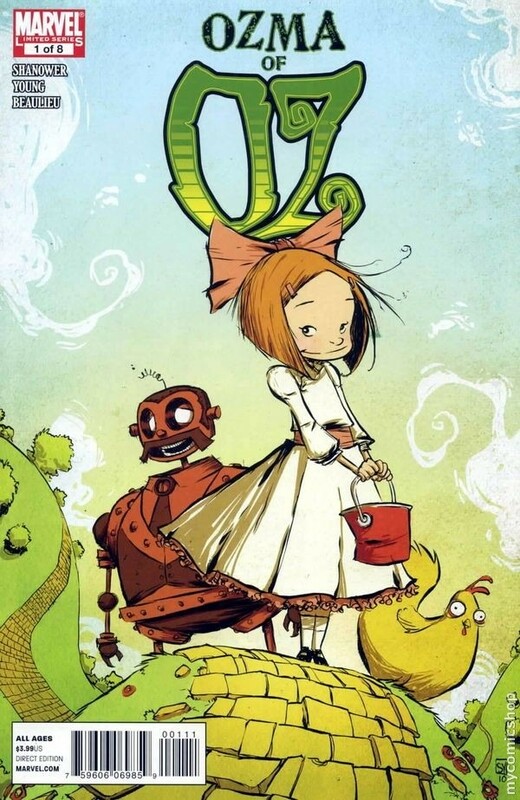 Ozma of Oz is a comic book adaptation of the L. Frank Baum book of the same name. Like the other Oz comics, this title was written by Eric Shanower with art by Skottie Young. Dorothy Gale is on a trip with her Uncle Henry when a rather intense storm hits that sends Dorothy overboard. In time she wakes up to find that she has somehow drifted away into seemingly another realm with her now-talking chicken Billina with her. As they explore the area, Dorothy continues to wonder where they might be where trees grow lunch pails since she cannot remember Oz having a seashore. But before they can puzzle over things further, they encounter a message that warns them to "BEWARE THE WHEELERS" just as the wheeled creatures make their appearance and harass Dorothy and her hen. They manage to briefly escape the strange creatures by ducking into a strange door that reveals a clockwork man made of copper. After winding him up, he reveals himself to be Tik-Tok and manages to defend them against the wheeled creatures. In time he reveals how they are in fact in The Land of Ev. Meanwhile many of her more familiar companions from Oz lead by Ozma set out to cross the Deadly Desert in order to rescue the royal family of Ev. For those of you who also watched Return to Oz before reading this comic, please do your best to forget the movie. After all, it contains elements from different titles mixed into a single narrative, so comparing and contrasting the two won't make much sense. Any reasonable comparisons would probably involve the original book, which sadly I still have not had a chance to read in earnest. Boo me. I probably sound biased at this point when it comes to how much I love Skottie Young's art style and the kind of youthful dynamism he brings to his pages. It's now hard to imagine the Oz comics being done by anyone else given the strong resonance the visual representations with the original Oz stories, at least from my perspective. And the quality has not changed at all in this Oz title as every aspect of the story seems just as wonderful and magical as in the other comics. And that kind of consistency deserves praise indeed. The story itself was definitely quirky but the kind that I could appreciate a bit more compared to the last Oz comic. I guess it seemed a bit more focused especially with Ozma and her party but at the same time it knew how to laugh at itself like with the soldiers from Oz or almost any scene that involved Billena. And I have to admit that I really enjoyed the concepts behind a lot of the "villains" in this particular story. Sure, I still love Mombi from the prior title, but Princess Langwidere and her changing heads wasn't all that bad either. And then there's the delightful campiness built-into the very character of the Gnome King and his penchant for rocks and things of that nature. And of course a s a big fan of robots, I can't get away from the fact about how much I like Tik-Tok, Sure, the whole need to be wound up gives Tik-Tok severe limitations but it's also part of his charm. To some extent, my current appreciation for steampunk probably begins with this particular character and trying to imagine the kinds of gears and cog pieces needed to make him work. Ozma of Oz is yet another fun romp back into the magical worlds created by L. Frank Baum and it's great that Marvel is helping newer generations gain an appreciation for these stories. Thus it rates 4.5 magical trinkets that are actually members of the royal family of Ev out of a possible 5.